Black patterned square leg swimsuit. Microfiber swimsuit with side badge. Blue T-shirt and bermudas jersey set. Blue square leg swimsuit with slogan. Square leg swimsuit featuring a tropical print. Microfiber swimsuit with print on the leg. Jersey t-shirt and bermudas set. T-shirt and bermudas set with skater print. Microfiber swimsuit with surfing photo print. White T-shirt and bermudas set. Blue square leg swimsuit with ornamental stitching. T-shirt and bermudas set with photo print. Denim effect plush bermudas with rolled hemline. Blue short sleeve surf shirt. Plush bermudas with surfing prints. Yellow shirt with surf print. Blue jacket with surfing prints. Cotton bermudas with ribbed waist. Navy striped top and sleeve t-shirt. Green t-shirt with dot print. Clothes for stylish boys. The most popular fashion right now and the latest trends in t-shirts, shorts, dresses and skirts, at LOSAN. 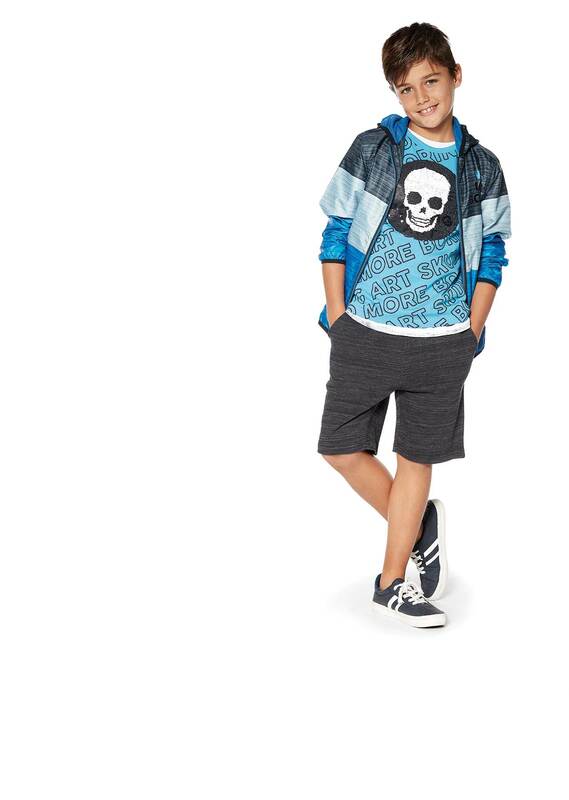 A fun, modern range of clothes where you'll find everything from the most modern, chic garments to the most popular timeless staples.Our fashion collection features modern, comfortable clothing for boys and a huge variety of sizes, as well as party looks, surf-inspired looks, trendy clothes and stylish clothes. Here you'll find the latest trends and styles ready to be worn on any occasion. Because you know exactly what you want, and when it comes to choosing the look that works for you, LOSAN's collection is a perfect choice. Comfy looks, different prints and trends, and a huge range of colours and designs that accentuate the fun side of fashion. Discover our new collection featuring designs made especially for you. Young wear with a modern, casual vibe. 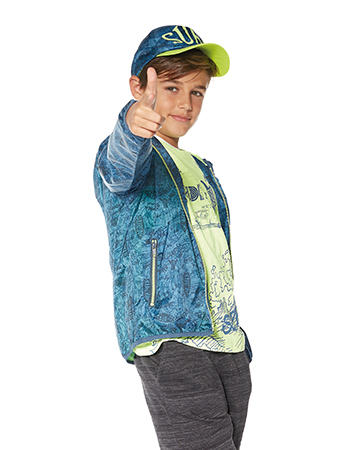 Bold fashion designs for boys aged 8 - 16 y/o, as well as a comprehensive selection of the trendiest, most popular garments and accessories. When it comes to choosing your looks, you know exactly what you want: comfort, design, quality, and, most importantly, uniqueness. Losan has the coolest t-shirts with awesome prints and slogans, essential go-to shorts, and those trendy accessories with which to finish your every look.